I'm a Life Catalyst specializing in teaching Applied Love Technology. So far, I've seen success with people, pets and plants. I'll make you laugh, I'll invite you to rethink the gifts in your situation. Give me 30 minutes to see if we're a professional match for each other. Sheryl Hirsch-Kramer was a nationally acclaimed calligraphy instructor and lecturer before a health crisis nearly ended her life in 1998. After thirty-five years as an artist, she recreated herself as a spiritual teacher, writer, intuitive, and energy therapy facilitator. She has presented her work at Steve and Barbara Rother's master Facilitator Intensive, the Integrated Energy Therapy tm Master Instructor retreat, and other spiritual venues across America. 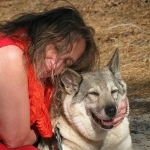 She especially enjoys helping other people understand the sacred connection with their own angel animals, living or helping other people understand the sacred connection with their own angel animals, living or dead. Catalytic, May 3, 2016 How do YOU love? Ask me how my mother could be a whiz at word games, could feed herself and walk with a walker, always knew who I was, and was largely present with those who crossed her path….until five days before her death. She was 91 years old and died of end stage dementia. Ask me how abuse, neglect and lack of compassion destroys. I learned this while going through the most difficult time of my life in 2011. Ask me how love heals. I learned this as I began to recover after experiencing a disabling stroke in 2012. Along with professional medical care, I consciously applied the healing power of love to help my dog, to help my mother, and to help myself. I call what I have learned love technology. So far, I’ve found it works for people, pets and plants. Have you received a scary diagnosis? Are you recovering? Are you caring for a loved one? I define healing as learning to be OK with wherever we are in our life’s journey. Sometimes we need a kind and experienced coach to help us find our way. How can I help you heal?